Cosmi was one of a handful of former Houston commitments who flipped to Texas and former UH coach Tom Herman. Cosmi, a three-star offensive lineman, flipped his pledge to Texas just two days before national signing day. Texas signed only two offensive linemen in 2017 — Cosmi and San Antonio Reagan's Derek Kerstetter. HUMBLE — In her home, Rodica Cosmi keeps what can best be described as a dream board. On the board, she has kept reminders of her dreams for her three children and husband. Her dreams for Samuel Cosmi, her only son, range from the customary (become a great man) to the far-fetched (reach the NFL). 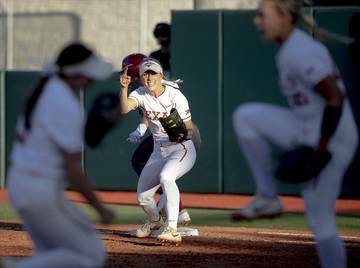 Somewhere along the road — Samuel guesses it was seven years ago — Rodica placed a Longhorns helmet by Samuel’s picture on the board. 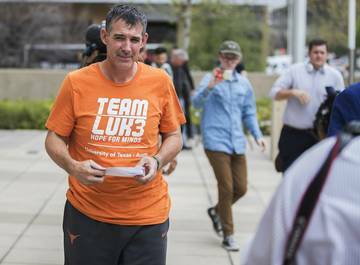 The Cosmis, after all, are a Longhorns-rooting family. 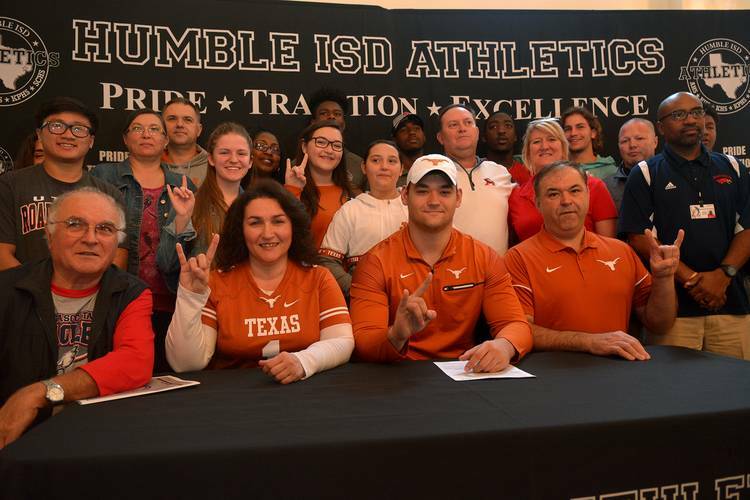 In February that vision became a dream come true when Samuel became a Longhorn on national signing day. 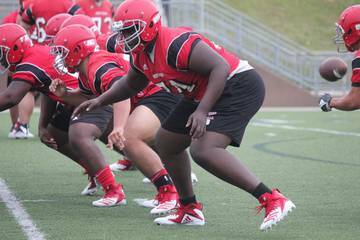 Cosmi, a three-star offensive lineman out of Humble Atascocita, is a 6-5, 290-pound muscular tackle. He joins San Antonio Reagan interior lineman Derek Kerstetter as the beef in Texas’ 2017 recruiting class. Soccer actually was the first sport that Cosmi played when he was young, but he was stuck playing goalie since he “got too aggressive, got too many red cards.” One day he asked his mother if he could play football. He was placed on a youth-league team called the Raiders, and after winning a championship and getting to ride in a limo as a prize, he was hooked. As with most players, Cosmi’s positions changed as he grew. The running back became a fullback, and the fullback became a defensive lineman. A chance to earn varsity minutes at Atascocita as a sophomore led him to the offensive line. An ankle injury sidelined Cosmi during his sophomore season, but he eventually developed into a solid player for the Eagles. He was a two-time all-district honoree, and his Eagles averaged 40.4 points and 456.3 yards per game during last year’s run to the state semifinals. (Atascocita had two games in which it exceeded 75 points). During his sophomore year, Cosmi said he weighed 215 pounds and was “struggling with 25s on the (bench press) bar” in the weight room. Over the years, though, he developed an obsession with the maintenance of his body. Trying to maintain his athleticism and agility, Cosmi works out six times a week. A day off includes an outdoor run. Part of his family’s backyard has been sectioned off for a 750-pound tire that he flips during one of his workouts each week. He also has studied up on clean eating and attempts to eat five or six times a day. Memphis extended Cosmi his first scholarship offer during the spring of his junior year, but he eventually committed to nearby Houston. Cougars coach Tom Herman, though, was hired by Texas that November, and Cosmi was left with a life lesson. 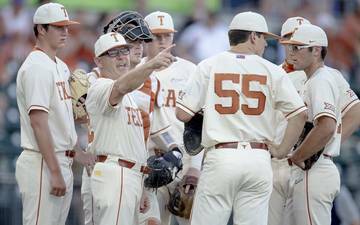 Herman will be Texas’ third coach in the last five years. His replacement at Houston, Major Applewhite, was the Cougars’ sixth hire since 2000. 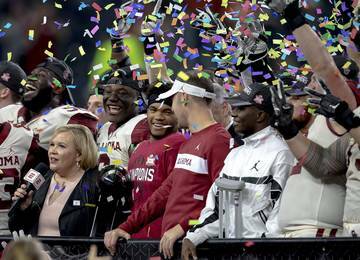 In college football, it’s much tougher for players to break their commitments once they sign, so Cosmi was counseled by a high school coach to pick a school he would be happy at in the long-term. 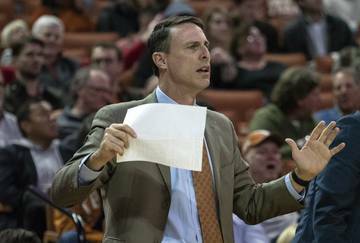 TCU and Texas came through with late offers, but Cosmi never made it to Fort Worth. 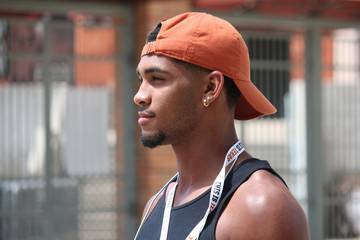 After visiting Texas on Jan. 27, he changed his commitment on Jan. 30, just two days before signing day. 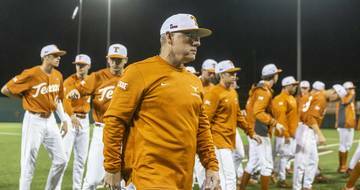 Cosmi was the third-to-last addition to Texas’ 2017 class, but he won’t be an outsider. He joins Brenham linebacker Marqez Bimage and Spring Westfield running back Daniel Young as UH pledges who turned into Texas signees. Cosmi said he’s eaten brisket at the barbecue restaurant that Young works at, and Bimage said the recruits often communicate with each other. 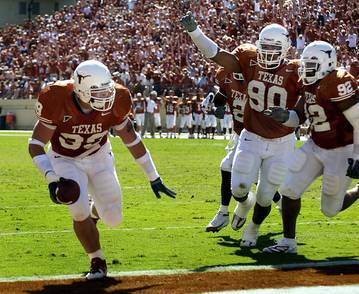 This fall, Texas retains plenty of able bodies on its offensive line. 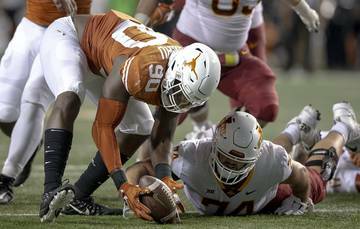 With Connor Williams at left tackle, Texas certainly won’t need Cosmi on Shane Buechele and Sam Ehlinger’s blind side. Brandon Hodges and Tristan Nickelson both started last season at right tackle, which is the position that Cosmi played at Atascocita.